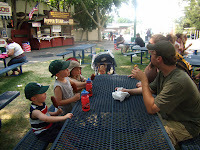 So, after breakfast and some errands, other daughter brought her sons over and we were off to the county fair! I always enter items - it is fun -plus you get a free entry ticket! So I entered 3 items, none of them worthy but what the heck. And so we wandered around the big building trying to find them. 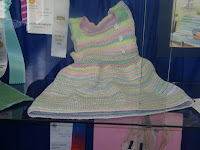 First we found Kaia's dress, which won a 3d place ribbon! 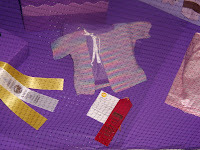 Guess there were no other entries in that category....I barely know how to crochet and so the crochet trim is really bad. And see the buttons offset - had to do that to hide a hole in the neckline! And then the sweater won a 2d place. Why, I dont know cause I saw some relly awesome baby sweaters there. This was the sweater from hell. Even wrote and complained to the designer about the pattern, and found out that the one I bought must have been old cause it has been updated since then. Never did find the ribbon I wanted. And since grandchild #5 is going to be a boy, I dont even know who this is for! Wish we could have gotten all 3 boys up there in time for this photo. 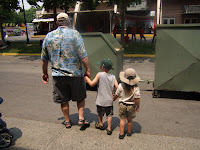 But there is PaPa with his 2 oldest boys....too bad the trash carts decided to go by right at that moment. Otherwise, I love this photo. And now it is corndog time! Well, only the 3 boys had corndogs. And it so reminded me of my son at this age....he did not like bread (still not one of his favorite foods). But he always had to have a corn dog....even tho he peeled away the corn and only ate the dog!!!! Of all the rides they went on, this ws the most hilarious. It is the baby sized ferris wheel. And they were the only ones on it. The guy told them to lean back and dont move (meaning dont stand up or move around or anything like that) and all 3 took him literally! The rode the entire time like this - and I think the guy gave htem extra time since there was not a line. We were hysterical the entire time watching them! It was a tiring day for all - and realized there were still things we did not do or see! Oldest grandson had a huge melt down at McDonalds on the way home....he sooooooo reminds me of his mother!!!! 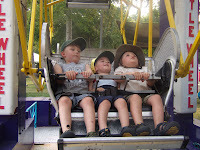 The Fair is always fun - but especially when you have kids to share it with!